Drive the legend, reborn – for less than you’d expect. The Toyota Supra returns to Canadian showrooms for the first time in more than 20 years, as the fully-loaded 2020 Toyota GR Supra prepares to turn heads and bust records on Track Days this year, at a MSRP of just $64,990, fully-loaded. “This is the classic Toyota sports car that racing enthusiasts have demanded – equally at home on the track as it is on the open road or the city street, aggressively styled to convey its authentic performance credentials, and loaded with features and amenities that will remind every Supra owner just how much fun driving can be,” said Cyril Dimitris, Vice-President, Toyota Canada Inc. The 2020 Toyota GR Supra is an iconic marque from Toyota’s history, brought forward into the future. This two-seater sports coupe is the first Toyota to earn the “GR” badge – signifying that it has been track tested and fine-tuned by GAZOO Racing, Toyota’s in-house motorsports team, which counts Toyota’s global president, Akio Toyoda, amongst its drivers. The GR is well-earned, with a lightweight, rigid, and 50:50 balanced body wrapped around a high-performance powertrain. 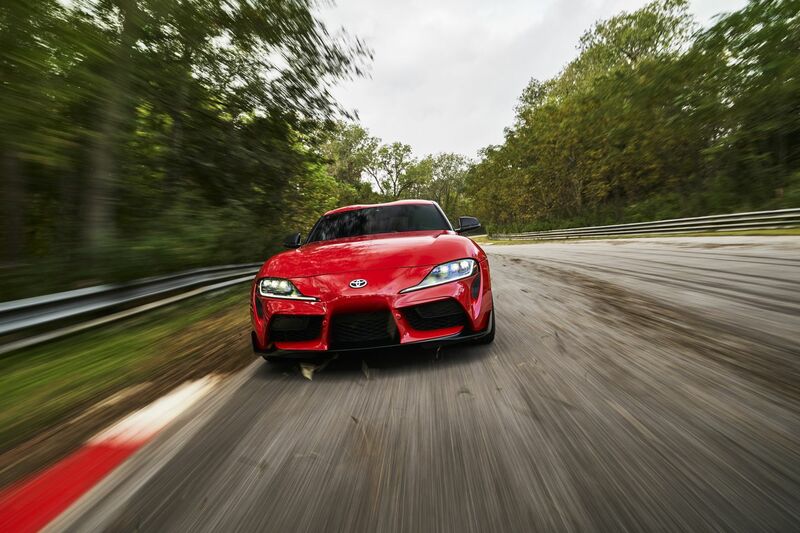 With a low centre of gravity, and 335 horsepower plus 365 lb-ft of torque delivered to the rear wheels, the Supra is ready to put all challengers in the rear-view mirror. It starts with a 3.0L inline 6 gas engine, enhanced with direct injection, variable valve timing, a twin scroll turbocharger. This powerful yet efficient engine is mated to an eight-speed automatic that delivers lighting-quick up- and down-shifts, enhanced with steering wheel-mounted paddle shifters for manual control. Short ratios for the lower gears and a Launch Control function enable powerful acceleration and maximum traction, with an estimated 0-96 km/h time of just 4.1 seconds. A limited slip active differential on the rear axle uses an electric motor and multi-plate clutches to minimize understeer and oversteer, as well as controlling lateral torque when cornering – even when accelerating or braking – to enable greater momentum and control through turns. On Track Days, the driver may engage the Supra’s Sport Mode setting, which reduces intervention by the vehicle’s traction and stability control functions, sharpens throttle response and active differential tuning, boosts steering weight and improves shift crispness for a more visceral driving experience. Precise handling is assured through features such as responsive, sport-tuned adaptive electric steering, adaptive variable suspension with sport tuning and dynamic damper control, 19-inch forged alloy wheels and four-piston red painted Brembo brake calipers. But performance is just the start of the package: The 2020 GR Supra offers much more, in a fully-loaded configuration. The 2020 GR Supra is fitted with an extensive list of standard features, starting with a 425-Watt 12-speaker Premium JBL Display Audio system with 8.8-inch screen, integrated Sirius XM Satellite Radio and untethered Apple CarPlay. A new Toyota Supra Connect feature enables a full-service concierge service, remote locking/unlocking, embedded navigation with over-the-air updates, automatic collision detection with SOS and roadside assistance, stolen vehicle locator, and more. Additional technology features – standard on every model – include a fully digital gauge cluster and head-up display. The 2020 GR Supra embodies its rich lineage at first glance, with a design that echoes that of the previous, fourth-generation Supra (1993-2002), the landmark 1967 Toyota 2000 GT, and the 2014 Toyota FT-1 Concept vehicle. A stretched hood highlights the engine while a taut but spacious two-seat cabin accentuates Supra’s ultra-wide stance. The prominent central front grille is flanked by large air intakes to aid with brake cooling. A double-bubble cabin roof design pays tribute to the Toyota 2000 GT even as it reduces drag. And an integrated rear spoiler helps suppress aerodynamic lift. The Supra’s curbside presence is punctuated by six-lens LED headlamps that integrate both daytime running lights and turn signal functions and rear combination lamps that blend the turn, tail and stop functions into a distinctive main ring shape. The Supra is a performance machine – but it’s also intended to be a daily driver. Standard heated sport seats clad in premium leather feature an integrated head restraint and a narrow main section that combines with generous shoulder bolsters to firmly hold the driver and passenger/navigator. A lightweight composite hatch opens to reveal a smartly trimmed luggage area with space for track tools or bags for a weekend getaway. In addition, every Supra enjoys many standard built-in comfort and convenience amenities. These include dual zone automatic climate control, carbon fiber interior trim, a leather-wrapped three-spoke steering wheel, a smart key system with push button start, aluminum scuff plates, integrated garage door opener, 14-way power driver and passenger seats with seat memory systems and power adjustable side bolsters and lumbar support, auto-dimming power-adjustable and heated exterior mirrors linked to the driver’s seat memory system, and more. The fully-loaded Supra is also extremely well equipped with a bundle of advanced safety systems, including forward collision warning, automatic emergency braking with pedestrian detection, full speed adaptive cruise control, lane departure warning system, road sign assist, parking sonar with rear collision warning, blind spot monitoring with rear cross traffic alert, a tire pressure monitoring system, an adaptive front lighting system with automatic high beam function, eight airbags, including driver and passenger knee airbags, a backup camera, and more. The 2020 Toyota GR Supra goes on sale this summer at Toyota Dealers across Canada.